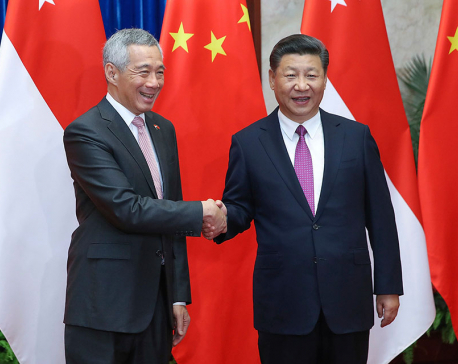 SINGAPORE, Nov 14 : Leaders from Southeast Asia, China and other neighboring countries met in Singapore on Wednesday and cited progress on keeping peace in the contentious South China Sea as evidence that the region is managing to handle such issues on its own. Both the Singapore meeting and a summit of the Asia-Pacific Economic Cooperation forum later in the week have drawn China’s leaders, Russian President Vladimir Putin and heads of other regional powers, but not President Donald Trump, who sent Vice President Mike Pence in his stead. The 10-nation Association of Southeast Asian Nations was focusing on issues of security and trade at its summit, with managing conflict in the South China Sea a perennial issue. China is pitted against its smaller neighbors in multiple disputes in the sea over islands, coral reefs and lagoons in waters crucial for global commerce and rich in fish and potential oil and gas reserves. 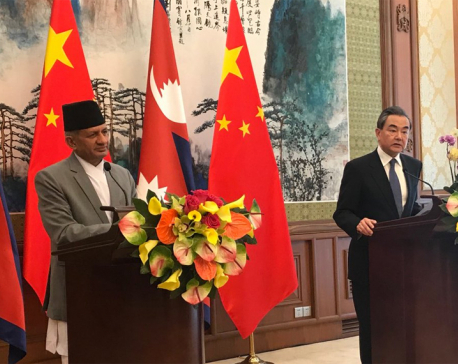 Chinese Premier Li Keqiang said the region has set a good example of managing those territorial disputes and keeping the peace as it works toward setting a “code of conduct” to govern navigation and other activities. “We have found the way to properly manage and defuse differences, for example, on the issue of the South China Sea in the past years,” Li said, adding that the situation was moving toward “greater stability” with progress toward a single draft text on a code of conduct in the sea. He reiterated Beijing’s hope to have a final agreement within three years. Philippine President Rodrigo Duterte said such a code is needed “at all cost” to govern behavior in the South China Sea to avoid miscalculations and trouble, suggesting that any risks were from potential trouble with outsiders. The region already has a nonbinding “Declaration of Conduct” but is working toward a more robust agreement. “Everything’s been excellent between China and the rest of ASEAN except for the fact that there’s friction between the Western nations and China,” Duterte told reporters as he headed into meetings. The Philippines earlier was one of the most vocal critics of China’s assertive moves in the disputed waters, where it has built up military installations and other facilities. In 2016, it largely won a complaint it lodged before an international tribunal that invalidated Beijing’s sweeping territorial claims in the South China Sea. However, Duterte took steps to revive once-frosty ties with China after taking office in 2016 as he sought infrastructure funding and more trade and investment from Beijing. Duterte cited a risk of “serious miscalculation” and potential clashes that could trigger military action based on mutual defense treaties. “So you are there, so you are in possession, you have occupied it, but tell us what route we should take, what kind of behavior ...” he said. Despite the apparent amity over territorial issues, the crisis over Myanmar’s ethnic Rohingya Muslims has overshadowed the meetings in Singapore. The atmosphere between Myanmar’s leader, Aung San Suu Kyi, and Malaysian Prime Minister Mahathir Mohamed appeared frosty after Mahathir lambasted Suu Kyi on Tuesday for her handling of the crisis that led to mass killings and the exodus of more than 700,000 Rohingya from Buddhist-majority Myanmar since August 2017. It was an unusually harsh rebuke among leaders in the 10-nation ASEAN bloc, who tend to avoid publicly criticizing each other. Mahathir, whose own country has a Muslim majority, said that as a former political detainee, Suu Kyi should show more compassion. Vice President Pence was due to meet with Suu Kyi on Wednesday, as well as with leaders of Vietnam, India and Indonesia. His mission, to advocate a “free and open Indo-Pacific policy,” was somewhat undercut by Trump’s absence while other leaders were attending the regional meetings. Trump’s security adviser, John Bolton, told reporters on Tuesday that the ASEAN meetings tended to be relatively flexible and Pence’s schedule was still being decided, but that some would be aimed at preparing for a meeting between China’s president and Trump at the G-20 meeting in Argentina later this month. That meeting will be closely watched for progress on resolving the standoff over technology policy that has led the U.S. and China to impose billions of dollars of tariffs on each other’s exports.